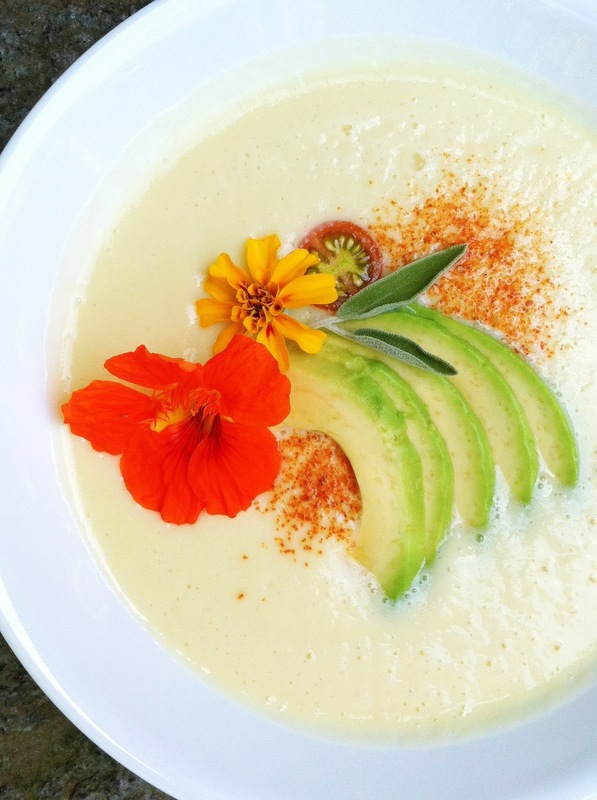 Creamy Cauliflower Soup. | Eat More Plants. I know it’s crazy to have hot soup on a hot day…but I got a vitamix for my birthday and I can’t. Stop. Making. Stuff. This was quite possibly the creamiest, lightest, cream of anything soup I’ve ever had/made! From the three days I’ve had it, I can absolutely say its worth it. So I was inspired by the cream of broccoli soup recipe in the cookbook that came with my vitamix. I had a big head of cauliflower so I based my creamy soup around that instead of broccoli. This would be equally good if you used broccoli, FYI. I came up with this off the top of my head, hope you enjoy it! Steam your cauliflower for 5 minutes, until it’s easy to pierce with a fork. Warm your milk and stock over low heat just until gently simmering. Add all ingredients to your blender with the rest of the ingredients. caution: hot food in a blender will increase in volume as you blend it, be careful not to overfill or you will have a giant, creamy mess! If your soup is too thick, add more milk or stock. Too thin, add more (steamed) cauliflower. Serve with any garnish in season, I used nasturtiums, marigolds, tomato, avocado and smoked paprika. Pea shoots or fried sage would be a great addition as well! Cream of whatever soup made vegan? I’ll take it! Is that 3 tablespoons vegie stock? Like 3 tablespoons of the broth stuff? What other soups have you vitamix’d? I just got a Vitamix 7500 to review for my site and am looking for something to pop it’s proverbial cherry with. I just got my vitamix for an early birthday present over the weekend…I’m in love!! This soup would not have come out as fluffy if I had used my immersion blender or my now shoved in the closet ninja blender. It really is amazing. So yes, 3 tablespoons of broth, whatever kind you have will be fine. Sometimes I use mushroom but mostly vegetable. The first thing I made in my vitamix was lemon ices, fitting because it was about 90 degrees and we needed something cool and refreshing. I highly recommend it! You can find the recipe for orange ices in the cookbook that comes with it or just google and you’ll find tons of icy fruit recipes! Maybe I’ll have a icee stand? It’s 95 and humid here (Chicago) too.